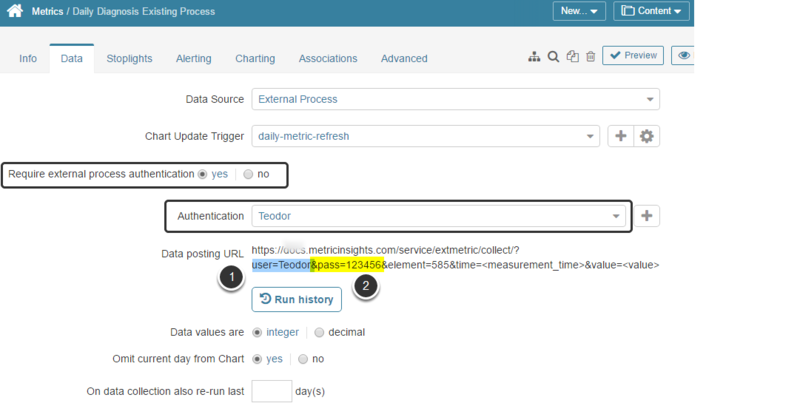 An External Process, when used as a Data Source for Metric Insights, generates a URL used to enter a Measurement Date and a Measurement Value. Any required authentication can also be automatically placed in URL. Use case is for an External Process that may be doing Data Collection. This can be used for real-time aggregates or some other complementary data processing tool that is crunching data and wants to put results in Metric Insights for charting. Repeat the process to enter as many values as required; when finished, return to the Metric Editor. NOTE: Since the required username/password are already in the URL; no additional data entry is required.